KU Visiting Assistant Professor of Jewish Studies, Dr. Eric Welch, shares the latest on the excavations taking place at Tell es-Safi, Israel. Tell es-Safi has been identified as the biblical city of Gath, the hometown of the Philistine champion Goliath. Come and discover how excavation is conducted in Israel and how “biblical archaeology” has matured over the years. See photos from the excavation site in Tell es-Safi, or the Biblical City of Gath, a study abroad program lead by Dr. Eric Welch. Gallery hours are M-F 9am-6pm. This annual conference brings together aspiring and established scholars of Jewish Studies. 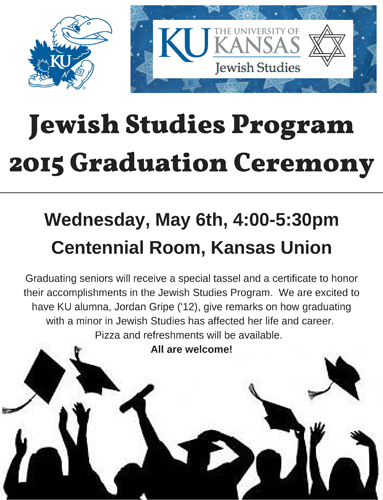 A celebration for our Jewish Studies students, faculty and staff. All are welcome! 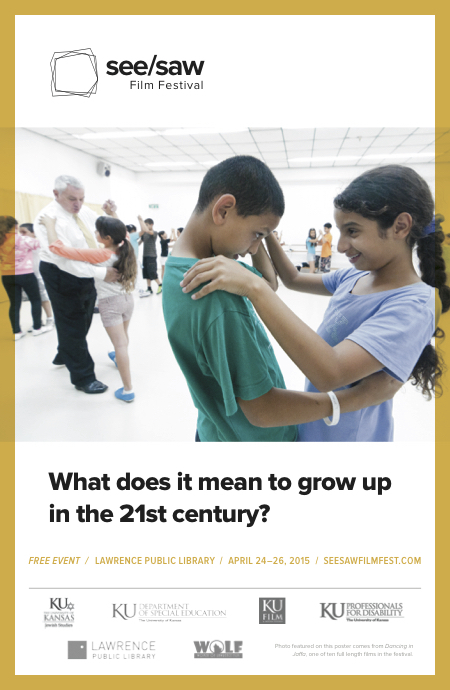 See/Saw Film Festival centers on exhibiting, disrupting and renegotiating constructions of children and young people who come from historically underserved and marginalized backgrounds. It takes place in the Lawrence Public Library from April 24-April 26. For generations, Jaffa has been a city divided by two communities that continue to grow increasingly apart. Over a ten-week period, Pierre Dulaine, four-time ballroom dancing world champion, teaches Jewish and Palestinian Israeli children to dance and compete together. The film explores the complex stories of three children, all of whom who are forced to confront issues of identity, segregation, and racial prejudice as they dance with their enemy. A Holocaust Remembrance Day Event. In his award-winning, emotionally riveting documentary, THE FLAT, Goldfinger follows the hints his grandparents left behind to investigate long-buried family secrets and unravels the mystery of their painful past. The result is a moving family portrait and an insightful look at the ways different generations deal with the memory of the Holocaust. Antony Polonsky is the Albert Abramson Professor of Holocaust Studies at Brandeis University specializing in Near Eastern and Judaic studies. He is a leading expert on Polish-Jewish history, and the editor of Polin: Studies in Polish Jewry. He is the author of many significant historical books and articles on Jewish history including the acclaimed three-volume work, The Jews in Poland and Russia. John Younger, Professor of Classics and the Academic Director of Jewish Studies will participate in the Tenth Annual Paul Rehak Symposium of Ancient Art. His lecture is called "A 4000 Year Old Pottery Workshop on Crete: Making Pottery Then, Thinking Pottery Now." This year the annual Rehak Symposium will feature presentations by scholars noted for their contributions to our understanding of the excavations of archaeologist Harriet Boyd. Other speakers include Susan Hueck Allen and Leslie Preston Day. Robots, Automatons, and Cyborgs: Technology and the Humanities. The Mid-America Humanities Conference offers an interdisciplinary venue for undergraduate and graduate students to present their research. This year's theme explores what it means to be human in an era of fast-paced technological advances. Meet Deborah Lipstadt before her lecture on the reemergence of Anti-Semitism in the West at 7pm in Big 12 (5th floor, Kansas Union). Deborah Lipstadt is a historian and author of the books Denying the Holocaust and The Eichmann Trial. She was an historical consultant to the United States Holocaust Memorial Museum, and was appointed by President Clinton to the United States Holocaust Memorial Council. She is the Dorot Professor of Modern Jewish and Holocaust Studies at Emory University. 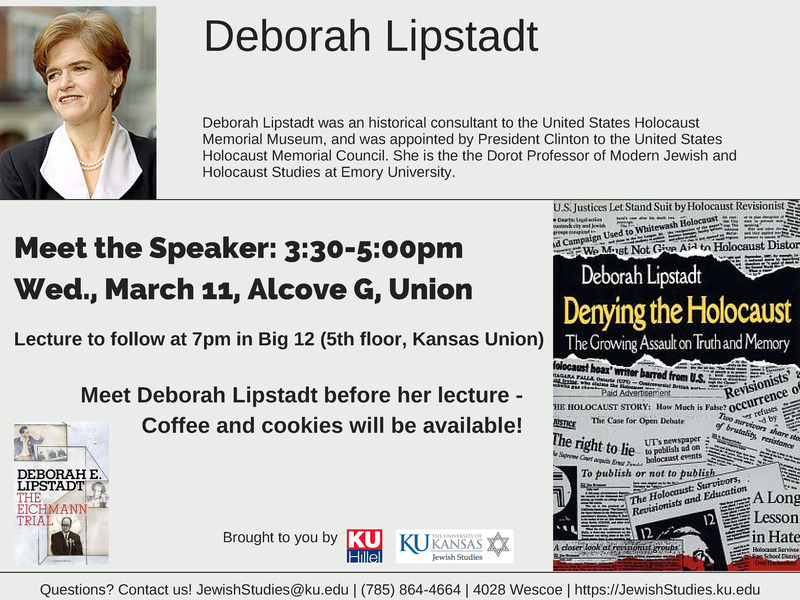 On March 11th, the University Daily Kansan featured an article and interview with Deborah Lipstadt: view the article here! 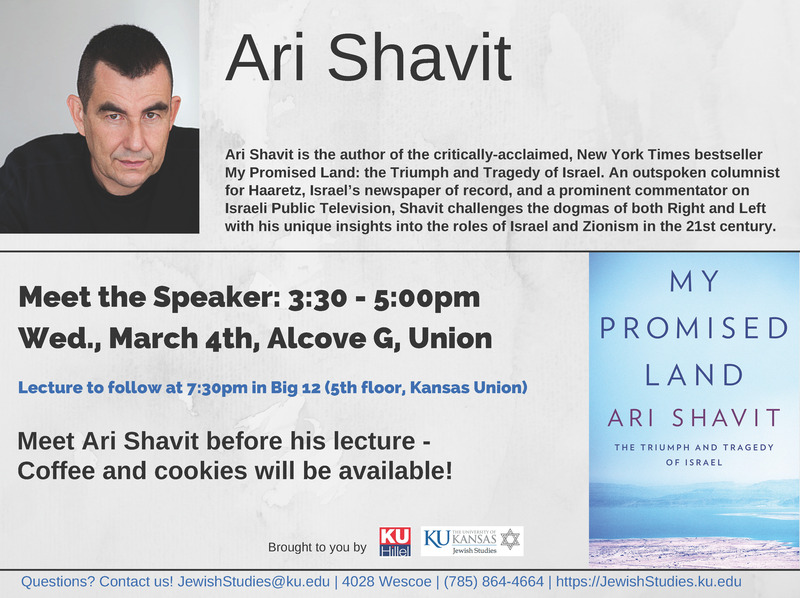 Meet Ari Shavit before his lecture at 7:30pm in Budig 130. Ari Shavit is the author of the critically-acclaimed, New York Times bestseller My Promised Land: the Triumph and Tragedy of Israel. An outspoken columnist for Haaretz, Israel’s newspaper of record, and a prominent commentator on Israeli Public Television, Shavit has become one of the strongest voices in the nation’s public arena. He challenges the dogmas of both Right and Left with his unique insights into the roles of Israel and Zionism in the 21st century. On March 4th The University Daily Kansan featured an article and interview with Ari Shavit: view the article here! Global Food for Thought with Professor John Younger: "A 4000 Year Old Pottery Workshop on Crete: Making Pottery Then, Thinking Pottery Today"
Global Food for Thought: Lunchtime Lecture series presented by The Center for Global & International Studies with John Younger, Professor of Classics and Academic Director of Jewish Studies. Since 2011, Younger has been excavating a huge Minoan pottery workshop in East Crete dating to about 1800 BCE. The last digging season was in 2014; now Younger and his team are studying the objects they excavated. Younger will discuss his goal of reconstructing, step by step, the process of making pottery 4000 years ago. 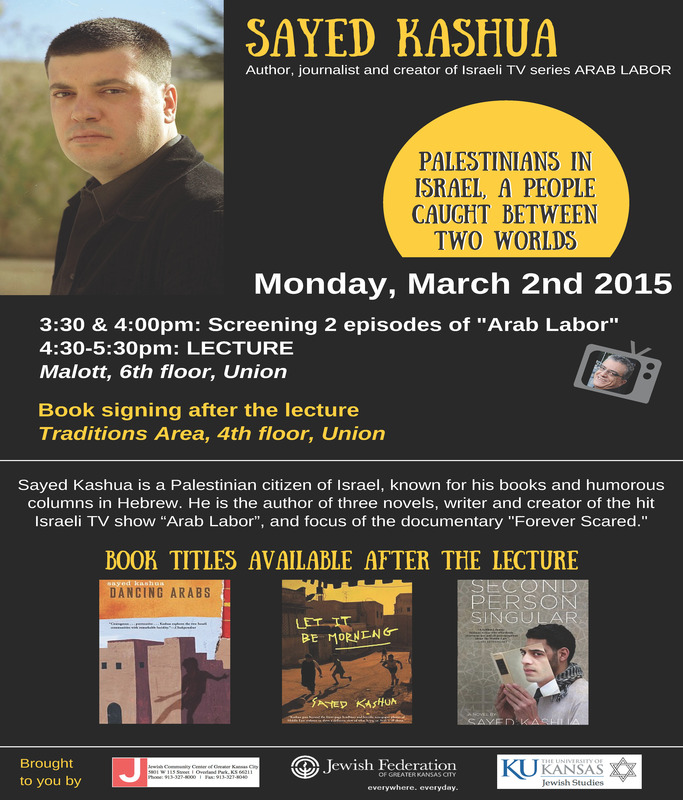 Sayed Kashua is a Palestinian citizen of Israel, author, and journalist born in Tira, Israel, known for his books and humorous columns in Hebrew. Kashua is the author of three novels: Dancing Arabs , Let it Be Morning, and Second Person Singular. He is the writer and creator of the hit Israeli TV show “Arab Labor”, and is the focus of the documentary Forever Scared. His novel Dancing Arabs has been made into a feature film, and premiered in 2014 at the Telluride Film Festival. Kashua is the winner of many awards, including the prestigious Berstein Prize. 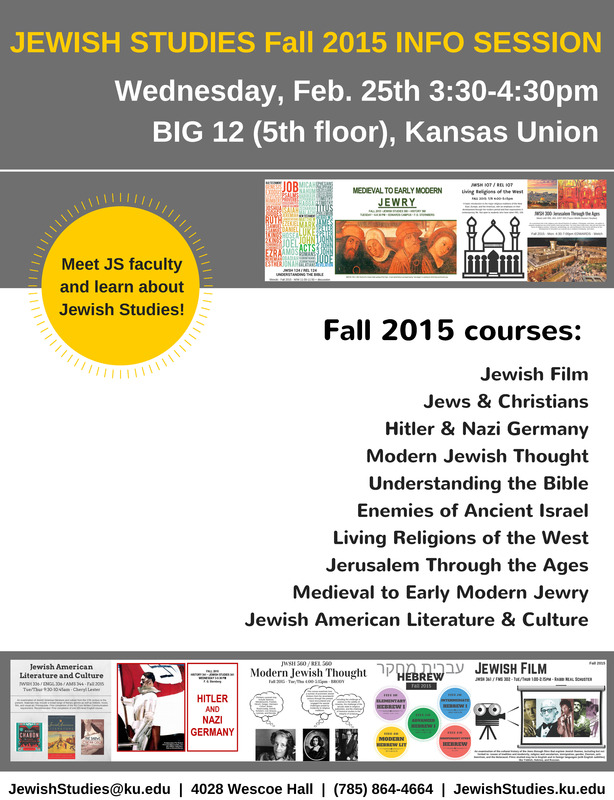 Meet Jewish Studies faculty and take a look at the Jewish Studies course offerings for Fall 2015. The University Daily Kansan published an article on the dedication of the Torah scroll: view the article here! All are welcome! Light refreshments served. The State of Kansas will again host a Holocaust Commemoration Service, with the theme, “Confronting the Holocaust”. Keynote speaker will be Benoit Westly, President and CEO of Xelat Group, the Netherlands. Mr. Wesly, whose brother perished in the Holocaust, is a leader of the Netherlands’ Jewish community and an honorary consul of the State of Israel. He will speak on, “Did We Learn From the Holocaust?” Holocaust proclamation will be given by Governor Sam Brownback, with participation by Kansas clergy, political leaders and students. Holocaust survivors, WWII veterans and children of survivors will be recognized. This service is free and open to the public. 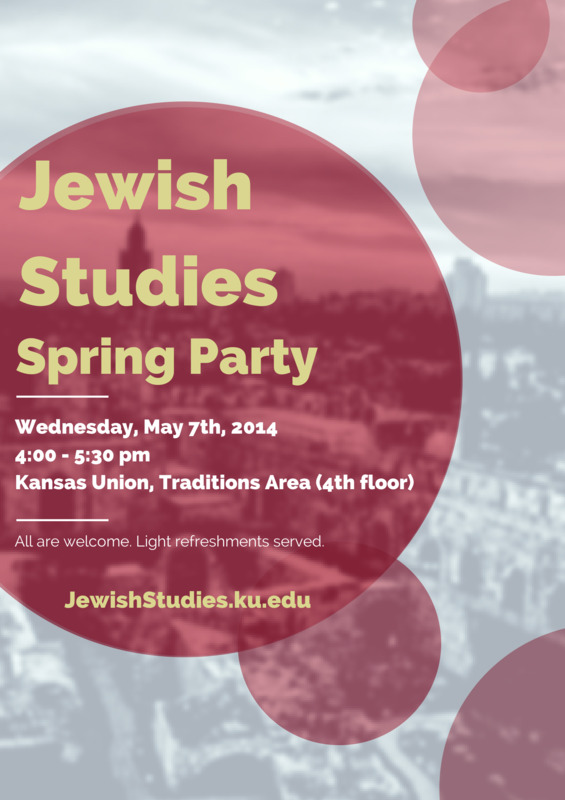 A reception sponsored by the Kansas State Holocaust Commission will follow the service. For more information, call 785 272-6040. "Canaanites, Philistines, and others at Tell es-Safi/Gath - The Hometown of Biblical Goliath"
Aren Maeir's primary professional focus is the Tell es-Safi/Gath Archaeological Project (for which he is the director), a long-term, multinational excavation of one of the largest ancient sites in the Land of Israel, a site that is identified as "Gath of the Philistines," home of Goliath (see the project blog at http://gath.wordpress.com). The finds from this excavation have been quite extraordinary, including the earliest-known siege system in the world, the so-called Goliath Inscription, well-preserved destruction layers with rich finds, and a large stone altar reminiscent of the altar in the biblical description of the Tabernacle (mentioned in Exodus 30), which received the attention of the world press. Film Screening: "Some of My Best Friends are Zionists"
The film interviews both young people like Jesse and notable Jewish artists and intellectuals like Tony Kushner, Judith Butler, James Schamus, and Gary Shteyngart, asking them what they were told about Israel as they were growing up, why that world view was as compelling as it was, and how they came to change their minds. 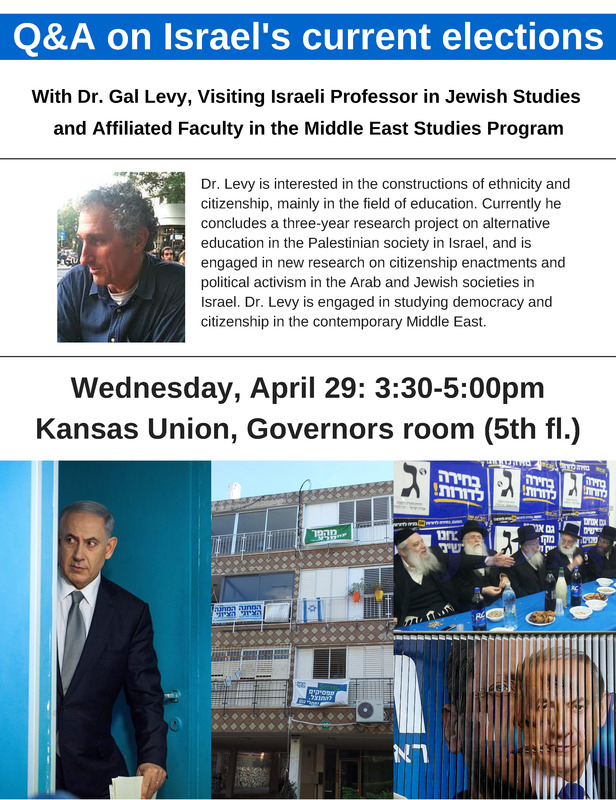 An Israeli former senior official on Arab affairs will discuss current and future implications of turbulence in the Middle East during the 2014 Diplomat’s Forum lecture this week at the University of Kansas School of Law. www.news.ku.edu/sites/news.ku.edu/files/images/general/pev100.png">http://www.news.ku.edu/sites/news.ku.edu/files/images/general/pev100.png" style="width: 100px; height: 133px; float: right;" />Avi Melamed, the Rosenzwog Fellow of Intelligence and Middle East Affairs for the Eisenhower Institute in Washington, D.C., will deliver a talk on “The Middle East: Winds of Change and Quicksand – The Arab Awakening, Israel and the Region” at 4 p.m. Thursday, March 27, at the Stinson Leonard Street LLP Lecture Hall, 104 Green Hall. The lecture is free and open to the public, and a reception will follow the event. Film Screening: "One Day After Peace"
Can the means used to resolve conflict in South Africa be applied to the Palestinian-Israeli conflict? Robi Damelin, born in South Africa during the apartheid era, loses her son who was serving with the Israeli Army reserve in the Occupied Territories. At first she attempted to initiate a dialogue with the Palestinian who killed her child. When her overtures were rejected, she embarked on a journey back to South Africa to learn more about the country's Truth and Reconciliation Committee's efforts in overcoming years of enmity. Robi's thought-provoking journey leads from a place of deep personal pain to a belief that a better future is possible. The screening will be followed by a discussion. Avi Melamed, the Rosenzwog Fellow of Intelligence and Middle East Affairs for the Eisenhower Institute in Washington, D.C. The lecture is free and open to the public, and a reception will follow the event. An Israeli former senior official on Arab affairs will discuss current and future implications of turbulence in the Middle East. “Decades of unrest and growing tensions have finally erupted in The Arab Awakening,” said Melamed, a former intelligence official. “The turbulence is rocking the Arab and Muslim world and generating changes across the region.” Fluent in Arabic, Melamed is the founder and creator of Feenjan – Israel Speaks Arabic, a nonprofit initiative that presents contemporary Israeli society and culture to the Arab world in Arabic and serves as an online platform for Israelis and Arabs to discover and discuss issues of common interest. Melamed has authored two books, “Separate and Unequal: Israel’s Rule in East Jerusalem” (Harvard University Press) and “Ubrusi,” a novel. He is a frequent guest on English and Arabic networks, including Al Jazeera, BBC Arabic and i24news.